New York is home to thousands of different restaurants with cuisine available from all over the world at price points suited for every wallet. New York residents have cultural heritages that span to each and every corner of the globe, making it one of the most multi-cultural cities in the world. This has given New York a wide and varied food culture, with different types of world foods available alongside fusion foods and more traditional ‘American’ foods. This article will look at the type of food available in New York and will provide advice on where to eat. ›› Also do not miss out on the dinner cruises. -Cheap restaurants in NY: When you simple look for something quick and still tasty. -Fine dining: Luxury venues in NYC. Where celebrities and gourmet folks go. When only the best is good enough. New York is home to a number of iconic dishes that are native to the city. Some can be found on the city wide stalls, while others can be found in delis and restaurants. - New York has some of the best Italian restaurants in the world. One of the foods New York famous for is its bagels. New York bagels are often lightly toasted and filled with generous amounts of filling inside. Bagels can be found in nearly every restaurant and deli in the city, but the best bagels are to be found in specialised bagel spots. H&H Bagels, found at W 46th Street and 12th Avenue, and Absolute Bagels, found at Broadway and 107th Street, are considered to be two of the top bagel places. New York is also famous for its hot dogs. Hot dog vendors can be found on the corner of nearly every intersection with hot dogs available at prices as low as $3. Papaya King, a chain of restaurants that sell high quality hot dogs, is also recommended. The tastiest New York hot dogs can be found in Coney Island, with Nathan’s Famous making some of the best. Nathan’s Famous can be found at 1310 Surf Avenue. The New York deli sandwich is also a delicacy. The consistency and taste of the bread is unlike anywhere else in the world, and the deli shops make sure to pack the sandwich full with filling. Katz’ Deli, found at Houston and Ludlow Streets, produce some of the best deli sandwiches New York has to offer. Burger joints and sandwich are an option for budget conscious eaters, as are the Chinese dumpling and noodle restaurants found in Chinatown. 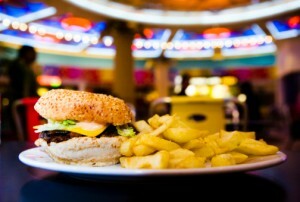 Many restaurants also run lunchtime and dinner buffets, offering quality food at affordable prices. Most restaurants in New York are able to cater for families with children’s menus being readily available. There are, however, a few recommended places to visit. Alice’s tea shop, found at 102 West 73rd Street, offers delicious food and drink in an Alice In Wonderland themed tea shop while La Bonne Soupe, found at 48 West 55th Street, offers high quality bistro food with set menus available for adults and juniors. New York is also home to a number of restaurants with a romantic atmosphere. Gramercy Tavern, found at 42 East 20th Street, Union Square, found at 21 East 16th Street and One If By Land, Two If By Sea, found at 17 Barrow Street, are amongst the best in the city with a romantic ambience designed specifically for couples. Reservations are recommended. Daily deals websites also offer New York diners a way to enjoy high end cuisine at cheaper prices. Webpages like ‘Google Offers Uptown‘, ‘Living Social Midtown’ and ‘Groupon NY’ often offer discount meals at some of the finest restaurants New York has to offer. Generally, the quality of food in New York restaurants is of a high quality. Competition is fierce and only the best restaurants survive. However, restaurants close to tourist areas are often more expensive than restaurants found in other parts of the city. The quality of food can also be lacking in some of these restaurants. Try to avoid the tourist hot spots and stick to the eateries that New York natives choose to eat at. There are few better places in the world for food lovers than New York. With a wide and varied food culture with options suited for every budget, New York will be sure to satisfy even the fussiest of eaters.